MGK-GLOBAL is a forex broker. 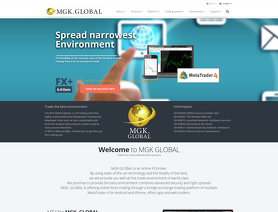 MGK-GLOBAL offers the MT4 and Mobile forex trading top platform. MGK-GLOBAL.com offers a number of forex pairs for your personal investment and trading options. Try to call their office phone number provided but number is not in service. The location of their office compare to the location of the phone number is way different. The broker also not accepting local clients. This must be something fishy about this broker.